ALVARADO, Juan Bautista (1809-1882), native-born Californian and 12th Mexican governor of California who served from 1836 to 1842. During his term of leadership, he granted Santa Cruz Island to Mexican citizen Andres Castillero in 1839. Governor Alvarado granted title of the island to the water’s edge. 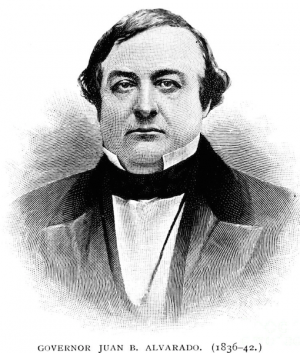 Fifteen years later, in 1854, Alvarado testified before the U.S. Land Commission on behalf of Andres Castillero’s attorney in fact, José Antonio Aguirre. Alvarado swore that Castillero told him Aguirre was to have one half of Santa Cruz Island for taking care of it. Despite Alvarado’s testimony however, Aguirre’s claim was not recognized, and Andres Castillero’s grant was upheld. Alvarado retired from public life following the American takeover of California during the Mexican American War. Juan Bautista Alvarado died on July 13, 1882. He is buried in St. Mary's Cemetery, Oakland, California. This page was last edited on 24 May 2017, at 06:24.